The adjustment of the damper is as simple as can be with a built-in knob at the top of the damper mount for easy access. Simple adjustments can be made to tune to your style of driving and comfort level desired. 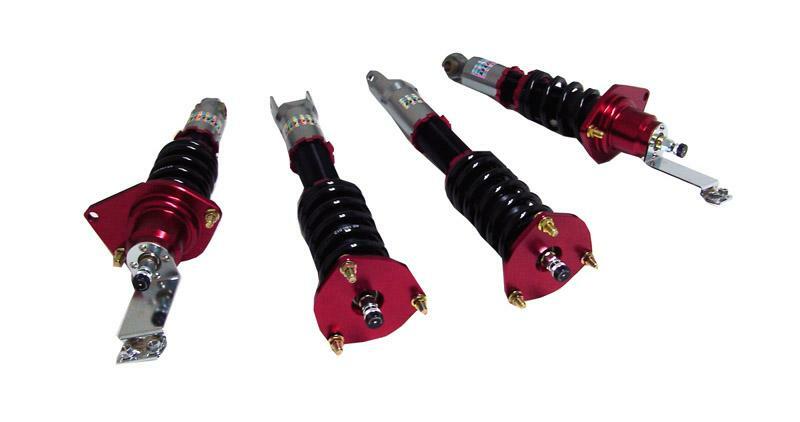 Single-Adjustable dampers make suspension adjustments easy to tune whether youre a professional mechanic or an automotive enthusiast with amateur mechanical skills. The height adjustment is made easy with CNC-Machined locking perches for accuracy and smooth adjustment. You can raise your car up to factory height for OEM appearance with performance handling or you can drop your car all the way down for a formal racetrack and an aggressive stance lowering your center of gravity to gain full potential of your cars handling capabilities. Excellent price and fast shipping. Product showed up as described and timely. Thanks Autoplicity you had the best prices I could find, fast shipping, and everything I ordered was exactly what I was looking for! Great Customer Service! absolutely lowest price on my Griffin radiator and super fast with the shipping to boot, what more could you ask for! Quickly received item. Exactly what I ordered and was best price out there. Will do business with them again. Great pricing and delivered in 3 days.